The ING Taipei International Marathon (TPE), BSNL Bangalore International Marathon (IND), and the Powerade Monterrey Marathon (more) (MEX) were held on Sunday 16 December. The Antarctica Ice Marathon (more), originally scheduled for 12 December, had to be delayed until 20 December due to storm conditions (more). The last AIMS events held in 2007 were those on New Year's Eve, the St Catherine Marathon (EGY) and the Sao Silvestre 15km (more) in Sao Paulo (BRA), while the first event of 2008, the St Croix International Marathon (more) in the US Virgin Islands, was held on New Year's Day. 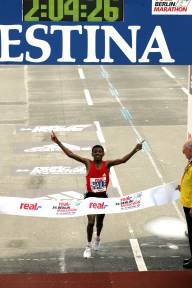 IAAF launches their televised road running magazine at the beginning of 2008, featuring more than 50 countries in the 50 weekly programmes, covering lifestyle, competition updates, runner profiles, and much more. The Running Road Show is for runners, their families and fans and will link elite performers to club runners and to the everyday jogger. The show will provide tips, news and features of interest to the entire community. The TV magazine which was officially launched this autumn at Sportel, Monaco has FOX as its commercial partner in a deal that will run through 2008 with an option to continue for further years. "Road running is the most populous, diverse branch of our sport," commented IAAF President Lamine Diack. "What other major sport offers recreational participants the possibility to compete alongside elite performers? The average footballer can't play with Ronaldo, but the average jogger can toe the start line with Radcliffe." "The IAAF wishes to strengthen its connections with and further help to promote this mass movement. The Running Road Show is a dynamic new tool for achieving this goal by offering attractive TV to the road running community, by providing vital year-round TV coverage." Based in Los Angeles, Fox Sports International (FSI) is an international sports programming and production entity housed within the Fox Cable Networks Group. FSI joined with HM Capital Partners, LLC to form Fox Pan American Sports LLC, one of the world's largest Spanish-language sports operations and programming ventures, spanning North, Central and South America, as well as the Caribbean. Before Haile Gebrselassie broke the world marathon record in Berlin back on 30 September his manager Jos Hermens said: "I'd like him to break the record by a little in Berlin, and by a lot in Dubai" writes Pat Butcher. After taking 29 seconds off in Berlin, he will attack his own record in Dubai on 18 January. Sammy Korir, third fastest ever with 2:04:56, is the best in the field next to Haile, although he is only now returning from a lengthy shinbone injury since winning Rotterdam in 2006, his last completed marathon. But there will be no shortage of takers in what is potentially the biggest payday in marathon history. The men's and women's prize pot is one million dollars, with the biggest ever first prize of $250,000 for each; and a million dollar bonus for a world record. Defending champion William Todoo Rotich ran 2:09:53 last year and said: "with the right people and pacing, someone could do 2:05 here". Ted Corbitt, a pioneer in methods of both long distance training and the measurement of road race courses, has passed away at the age of 88. Born in South Carolina in 1919 Corbitt's family grew corn and cotton. Growing up with farm duties from an early age, he developed a tough, wiry physique and strong work discipline. In the segregated society of the time, he had to get to school on foot - and discovered the joys of running. After his family moved to Ohio he competed in high school meets and then at the University of Cincinnati, where he earned a Masters degree. In 1950, after marriage and qualification as a physical therapist, he resolved to run the Boston Marathon, preparing himself according to what he could find out about the legendary Emil Zatopek's training methods. "I used a lot of the resistance exercises that were a part of physical therapy treatment to build up my legs" he said. He also used Zatopek's "interval" sessions for speed endurance and long, slow runs for stamina. In the 1951 Boston Marathon he placed 15th but the following year he made the Olympic Marathon team. It was the Helsinki Games, in which Zatopek won 5000m 10000m and marathon in Olympic record times. His success redoubled Corbitt's resolve and his training leapt to between 200-300 miles a week. Corbitt set US records for 25 miles on the track, the marathon, 40 miles, 50 miles and 100 miles - this last at the age of 50. He won US and Canadian Marathon Championships but retired from serious competition in 1974 after a bout of bronchitis, although he continued to run marathons and ultra races. In 2001, aged 82, he walked 303 miles in a six-day competition. But Corbitt left his greatest mark in administration of his sport. He was the first president of the Road Runners Club of America, and co-founder of the New York Road Runners Club. He was formative in shaping masters' competition and in developing reliable methods of measuring road race courses. The Marine Corps Marathon and Washington DC's FAMILY Magazine have declared the category winners of the Healthy School award. These were the schools with the most students participating in the MCM Healthy Kids Fun Run, a one-mile un-timed run on the day before the Marine Corps Marathon. Charles Barrett Elementary School, with under 300 students, had 114 participating; Lynbrook Elementary, with 300–600 students, had 168 participating; and Eagle View Elementary with over 600 students, had 195 participating. Washington FAMILY Magazine will make a $500 donation to each school's physical education department. "Encouraging children to be physically active is a priority," said Brenda Hyde, publisher of FAMILY Magazine. A total of 1,985 children between 6 and 13 participated in the run - the largest turnout ever. Kids represented more than 260 schools throughout the US. Voted "Best Marathon for Families", the Marine Corps Marathon continues a combined tradition of dedication, sportsmanship and patriotism. Runners from all walks of life participate in the world's largest marathon to not offer prize money, deservedly nicknamed "The People's Marathon." The 33rd Marine Corps Marathon will be held on 26 October 2008. After a frenetic start to the month, with 14 events held on the first weekend in December, the pace slows over the change of year, with only 11 AIMS races scheduled over the following six weeks. Next up was the Honolulu Marathon (more) on 9 December, followed on 12 December by the Antarctica Ice Marathon and 100km Ultramarathon held at a latitude of 80 degrees South. December started with the Reggae Marathon (more) in Jamaica on the first of the month, followed by thirteen races the next day. The 61st Fukuoka International Open Marathon Championship (more) (JPN), the Standard Chartered Singapore Marathon (more), the Macau Galaxy Entertainments Marathon (more), UNICEF Charity Run Half Marathon (more) in Hong Kong, and the Angkor Wat Half Marathon in Cambodia opened the day's programme in east and south-east Asia. The Milano City Marathon (more) and the Lisbon International Marathon (more) provided the European venues before action moved back to the Caribbean where the Run Barbados Marathon (more), the Cayman Islands Marathon (more) and the Costa Rica Marathon (more) were held. In South America the Pampulha Lagoon Race (more) (17.8km) was run in Belo Horizonte (BRA) while further north the Gran Marathon Pacifico (more) in Mazatlan (MEX) and the Las Vegas Marathon (more) rounded off the day's action. Haile Gebrselassie was presented with the AIMS/Citizen World's Fastest Time Award on 23 November 2007, at the Great Ethiopian Run pre-race press conference at the Sheraton Hotel, Addis Ababa for his World Record performance (2:04:26) at this year's Berlin Marathon on 30 September. 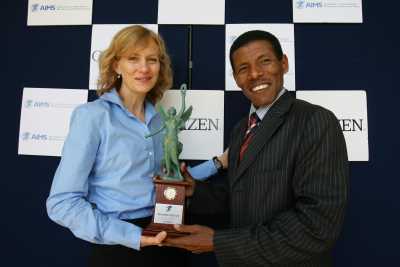 Haile received the AIMS/CITIZEN WORLD'S FASTEST TIME AWARD from Mary Wittenberg of the New York City Marathon. This time is the fastest time ever run for the marathon distance, and is recognised by both AIMS and IAAF (International Association of Athletics Federations). AIMS President Hiroaki Chosa comments: "It is with pleasure that we recognise this achievement of Haile Gebrselassie. Ethiopia is a country greatly respected throughout the rest of the World for producing some of the finest athletes ever seen. Haile is now officially the fastest man in the World over the marathon distance." Haile Gebrselassie remarked, "This is really wonderful. I want to say thank you to AIMS and IAAF. Thank you also to Citizen for giving me this award from my race in Berlin. I am so happy to receive this award." On 24 November, the day before the 13th Samsung 10K Corpore São Paulo Classic, Corpore Brazil gathered 20 people from various race organizations in Brazil and neighbouring countries to discuss matters of mutual interest during the 1st Preparatory Meeting to the 17th AIMS World Congress, that will also be organized by Corpore on the occasion of the 10th São Paulo Corpore Half Marathon, in April 2009. Also attending the meeting were coaches, former runners and official representatives of various cities . David Cytrynowiz and Octávio Aronis, Corpore's President and Vice President, hosted the meeting. Martha Morales, AIMS Board member, was an official guest and presented her observations of how races in Mexico had co-operated among themselves and affiliated to AIMS as a move towards greater international integration. The presentation developed into a workshop considering how races can grow within an international framework. Many attending races had up to 20 years of experience but felt that further improvement could come through greater international recognition, which might be gained by exchanging programs, wider publication of calendars and results, and attracting top foreign runners. Several races expressed a wish to affiliate to AIMS, including the nationally known 10km races. The Atlanta Marathon and Half (more) were held on their traditional Thanksgiving Day date, which this year is 22 November. The Malta Challenge Marathon, a stage race, was run on three consecutive days, starting with 11.195km on 23 November and continued with 6km and 25km legs. Another six marathons and four other races were held on 25 November, one of the busiest days in the AIMS calendar. The Toyota Great Ethiopian Run 10km (more) was held in Addis Ababa, and the previous day hosted the final event in the AIMS Children's series 2007. Lake Kawaguchi Marathon (more) in Japan, and the Shanghai Marathon (more) were followed by four European events: the Cyprus Aphrodite Half Marathon (more), the Firenze Marathon (more), the Marathon de La Rochelle - Serge Vigot (more) and the San Sebastian Marathon (more). In South America the Sao Paulo Corpore 10km Classic (more) took place in Brazil and the Medio Maraton Mitad el Mundo (more) in Quito, Ecuador. The University of Washington Medical Center Seattle Marathon (more) in USA completed the day's running programme. Lornah Kiplagat was presented with the AIMS/ASICS Golden Shoe award at the Seven Hills Race in Nijmegen (NED) on 18 November. The award recognises her as the World's top female road runner. Lornah received the top award in world road racing from AIMS representative Wim Verhoorn. A dominant figure on the road, the track and the turf, Lornah. has won the World Road Running Championships for two successive years, and in between these victories scored an emphatic win in the World Cross Country Championships. Lornah Kiplagatreceives the AIMS/ASICS World Athlete of the Year Award from AIMS representative Wim Verhoorn. AIMS President Hiroaki Chosa comments: "Lornah is one of the World's most talented female runners of our time. She has worked very hard for many years to reach the very top of her sport. She is a credit to the sport investing much of her prize money winnings into funding a High Altitude Training Centre in Kenya for promising young athletes." Lornah Kiplagat remarked: "I am delighted to accept this prestigious award. It is always an honour to have your performances recognised and it is particularly pleasing to receive an award where over 80 countries around the world have been involved in the nomination process. I feel greatly honoured." For more information about the AIMS/ASICS Athlete of the Year Award <click here>. The Pharaonic 100km, both an individual and relay event, was held on 16 November from the Sakkara Pyramids just southwest of Cairo to the Hawara Pyramid at El Faioum. The event recreated an ancient test set by King Taharka to keep his army up to scratch. On 18 November the Tokyo Women's Marathon (more) and the Standard Chartered Bangkok Marathon (more) took place in Asia, followed by the Blom Bank Beirut Marathon (more). In Italy the Palermo Marathon (more) and the Garda-Trentino Half Marathon (more) were run. Across the Atlantic the Marabana Marathon and Half (more) in Cuba completed the AIMS programme for the day. Placed 4th for Great Britain in the last two Olympic Marathons, Jon Brown has declared that from now on he will be running for Canada. He has been a long-time resident of British Columbia and carried a Canadian passport but still competed internationally for Great Britain. Brown missed a marathon medal by just seven seconds in Sydney and by 15 seconds in Athens. He holds the British 10000m record of 27:18.14 and his best marathon time is 2:09:31. Brown had planned to run the Flora London Marathon last April, and traveled from Canada, but came down with a fever the night before the race and withdrew. "This decision has been long overdue" he said, "and has renewed my enthusiasm for the sport which had been waning recently". He will apparently try to qualify for the Canadian Olympic Team at the Fukuoka Marathon in December or Tokyo Marathon in February. He is 36 years of age and lives in Victoria, British Columbia. The Berlin Sports Museum, which incorporates the AIMS Marathon Museum of Running, recently added to its collection of memorabilia with the kit Haile Gebrselassie wore in setting the World record in Berlin on 30 September 2007 (2:04:26). The Museum is located in Berlin's Olympic Park and has an impressive collection of exhibits from the international running scene. 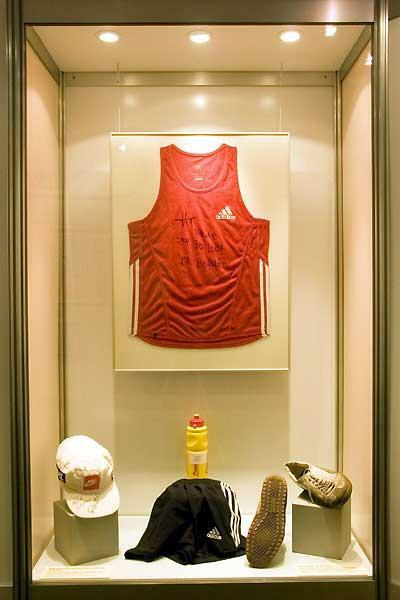 Two glass showcases now display running gear used by three of the five runners* who set World records in the real,- Berlin Marathon over the last decade. 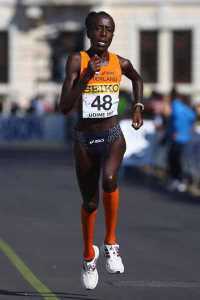 Tegla Lorupe (KEN) ran a world record of 2:20:43 on 26 September 1999 and her shoes are on display. 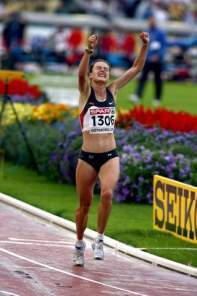 On 30 September 2001, Naoko Takahashi (JPN) became the first woman to run under 2:20 with a time of 2:19:46. The museum has one signed shoe on display as well as her water bottle and her race number. Alongside are spectators' signs and Japanese flags that were waved along the course, and a popular Japanese comic book which depicted her breaking the record even before she set foot in Berlin. Haile Gebrselassie donated his original racing vest and shorts right after he demolished the World record on 30 September. The collection also includes the running shoes worn by Günter Hallas (GER), when he won the first ever Berlin People's Marathon on 13 October 1974, but features only a small selection of material harvested from Berlin Marathon champions. Such is Berlin race founder Horst Milde's enthusiasm for the project that some runners were practically stripped after the race in order to save their clothes for the museum. Also on display is an exhibit of 18 illustrative panels, produced to mark the 25th anniversary of AIMS and which describe the historical development of the marathon in both English and German. A new AIMS member event, the Hangzhou Marathon (more) (CHN), was held on 11 November. With Armistice Day commemorations in Europe the only other AIMS event scheduled was the Big Sur Half Marathon (more) on Monterrey Bay, just south of San Francisco. Metal medals, produced from recycled materials by the Saharawi of Western Sahara, are being supplied to event organisers in Italy, Germany and elsewhere who have given their support to the Sahara Marathon 2007 Solidarity Project. The initiative has given employment and income to several Saharawi families in the refugee camps in which they have lived for the past 30 years, located near Tindouf, Algeria. The birthplace of the classical race, the village of Marathon in Greece, was the venue for the first AIMS Marathon Symposium, on the day before the Athens Classic Marathon. The symposium was a cooperative effort between AIMS, IAAF, the Athens Classic Marathon, the Greek Athletic Federation SEGAS, and the city of Marathon. It is intended to hold the symposium annually. "It is the aim of the marathon to bring together people from all over the world to a festival of sport and fair play," said Michalis Liapis, Greek's cultural minister at the opening ceremony at the tomb of the Marathon warriors. 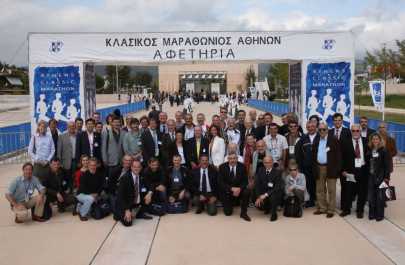 IAA General Secretary Pierre Weiss said that there could not have been a better venue for the Symposium, especially in connection with the Athens Classic Marathon. "This is the birthplace of sport and of the Olympic Games. So the IAAF happily supports the AIMS Symposium. Without the work of AIMS in the past 25 years the marathon would not be what it is today." At the Symposium Yannis Theodorakopoulos, Greek TV Sports Journalist and Mayor of Pefki, and the former international runner Maria Polizou, who still holds the Greek marathon record, recalled the historic roots of the marathon. Hugh Jones, former world-class marathon runner and present AIMS secretary, spoke about the tremendous development of marathon running in the past 30 years, from events of a few dozen runners with only cows for spectators to TV spectaculars with a cast of thousands which take over world cities for the day. He also referred to the enormous recent development in Asia. A main topic of the symposium was the economic impact of road races. "Analysing a marathon race in terms of economics one has to conclude that these races are highly attractive," said Wolfgang Maennig, who is a professor in economy science at the University of Hamburg. "Back in 1998 we found that the economic impact of the Berlin Marathon was 25 million Euros. Today's figures are much higher. Boston in 2003 is said to have had an impact of US$74 million while the figure for the New York City Marathon is even greater." Horst Milde, the man who developed the Berlin Marathon and who acted as Chairman of the Symposium organising committee, stated: "An important aspect for our future development is to motivate young people to start running. Races must think about this and include children's competitions." Timothy Kilduff from the Boston Marathon stressed that race organisers should also think about "media coverage, especially TV, the internet and Charity Running. But whatever you do, you always have to be respectful to the runners". "Today marathon is a way of life," said the Mayor of Marathon, Spiros Zagaris, who had been very eager and supportive to stage stage this symposium and also had been the key figure behind the opening of a new marathon museum in his town. The delegation had lunch in this museum. Among those invited for the marathon weekend were former World Champions Abel Anton (Spain/1997 in Athens and 1999 in Seville) and Rosa Mota (Portugal/1987 in Rome), who also became the Olympic Champion in 1988 and who on the first ever marathon championship for women over the Marathon to Athens course back in 1982. On 3 November many race organisers from around the world gathered in the town of Marathon for the inaugural AIMS Marathon Symposium, hosted adjacent to the start line of the Athens Classic Marathon, which was held the following day. Under the general title "Classic Marathon: Past, Present and Future" invited speakers, round-table discussions and audience interventions discussed: The First Marathon Race, which set the scene; The Transition of the Marathon - how it broke the mould to become a mass participation event; The Economic Impact and The Future of the Marathon. On the same day, the Taroko International Marathon (more) in Chinese Taipei started the month's running programme, followed on 4 November by the Joongang Seoul International Marathon (more) in Korea. Later on the action switched to Europe for the Athens Classic Marathon (more) and the St Denis Half Marathon on the outskirts of Paris. Three races were then held in the Americas: the 20km Nuevo Leon in Mexico, the UWI-SPEC International Half Marathon (more) on the Caribbean island of Trinidad and the Buenos Aires Marathon. On one of the busiest days of the entire AIMS calendar 12 events were held on 28 October, starting in Asia with the Chosunilbo Chunchon Marathon (KOR) and the Vodafone Delhi Half Marathon (more). The day's running programme continued in Africa with the Standard Chartered Nairobi Marathon and in Europe with the Istanbul Eurasia Marathon (more), the Ljublijana Marathon (more) (SLO), the 22nd Venice Marathon (more), the Dresdner Kleinwort Frankfurt Marathon (more), the Aland Marathon (more) in Finland and the Maraton del Mediterraneo (more) just outside Barcelona. Action then moved across the Atlantic, with one marathon in each of the three countries of the North American continent: The Fallsview Casino Niagara Marathon (more) (CAN), the Marine Corp. Marathon (more) in Washington DC and the Maraton Internacional de Guadalajara in Mexico. At the 2nd IAAF World Road Running Championships held in Udine ITA) on 14 October Holland's Lorna Kiplagat bested her performance of last year at the same Championships in Debrecen (HUN) to improve her 20km World record to 1:02:57. 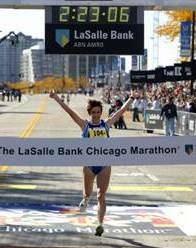 She went on to complete the half marathon distance in 1:06:25, beating Elana Meyer's 1999 figures from the Tokyo Half Marathon by 19 seconds. The 2nd IAAF World Road Running Championships took place over the half marathon distance in Udine (ITA) on 14 October, preceded by the mass race Maratonina di Udine (more), over a distance of 7.1km. The Zagreb Marathon (more) was held in neighboring Croatia, and elsewhere in Europe the Poznan Marathon (more) (POL), the Novi Sad Half Marathon (more) (SRB), the Timisoara Marathon (ROM) the Eindhoven Marathon (more) (NED) and the ING Brussels Marathon (more) were run. Hours later across the Atlantic Ocean the Mount Desert Island Marathon (more) (USA), the Toronto Marathon (more) (CAN) closed off proceedings for the second weekend of the running world's busiest month. European marathon champion Ulrika Maisch will run the Dresdner Kleinwort Frankfurt Marathon, making the field for this 26th edition the strongest yet. The 30 year-old had caused one of the biggest upsets at the European Championships in Gothenburg in 2006, when she snatched the marathon gold. But not only the quality of the elite field is growing in Frankfurt. The mass event is getting more impressive. So far more than 10,000 marathon runners have registered for Germany's oldest city marathon. With expected lated entries the final entry figure should be a record of nearly 12,000 athletes. Ulrike Maisch winning gold in Gothenburg in 2006: www.photorun.net Adding runners of other events the Dresdner Kleinwort Frankfurt Marathon will have a total entry number of around 18,000. Ulrike Maisch had been unable to run a marathon after her European triumph due to various injuries. After 14 months she finally returns to face Luminita Zaituc and Melanie Kraus in what is almost a national championship. For the three Germans it will be about qualification for the Olympic Games. After Irina Mikitenko's great debut in Berlin (2:24:51) there are most probably only two tickets left. Despite the strong German field favourites will come from elsewhere: Former Boston and Chicago Marathon Champion Svetlana Zakharova will run her marathon comeback in Frankfurt after giving birth. The 36 year-old Russian has a personal best of 2:21:31. She will target the course record of 2:25:12 and Kenyan Kutol Ruth Jepkoech (2:27:22) might not be far behind. The Samsung Melbourne Marathon on 7 October enjoyed record participation, when 16,294 people took part in the various events. Participation records were also set this year at the Gold Coast Airport Marathon in July with 16,172, and the Blackmores Sydney Marathon in September with 19,115. "There is always some healthy rivalry to claim the number one spot in Australia," said Gold Coast Airport Marathon General Manager Cameron Hart. "But all events have experienced a surge in numbers, and I believe that is only going to increase next year and beyond." According to the annual Exercise, Recreation and Sport Survey (ERASS) published by the Australian Sports Commission, close to 1,250,000 Australians exercised by running last year, a 12.9% increase since 2001. "We seem to be in the midst of a cultural shift with more and more Australians maintaining a healthy and active lifestyle," said Hart. "Big community events provide an opportunity for them to put their training and preparation into practice. This has created a mini marathon revolution which is exciting for us all." In terms of marathon participation this year (over the complete 42.195km), there were 2,917 runners in Melbourne, 2,841 on the Gold Coast and 1,526 in Sydney. "Melbourne has the MCG, Sydney has the Harbour Bridge and Opera House but we have the golden beaches" continued Hart. "Next year the 30th Gold Coast Airport Marathon on 6 July will be aiming for another record field". After the rehabilitation of Berlin's 1936 Olympic Stadium for the 2006 Football World Cup and the forthcoming 2009 World Athletics Championships, another event which it hosts has also been given a makeover. The Berlin 25km is under new management, which hopes to recapture its former glories. Founded by the French forces in West Berlin back in 1981, it was Germany's first major city race, and for most of the next decade it remained the largest, with well over 10,000 runners at that time. Gerhard Janetzky, Meeting Director of Berlin's IAAF Golden League Meeting ISTAF, and Christoph Kopp form the new organisation "Berlin Runs". "In a city like Berlin such a race with such an attractive course has to have more than 10,000 runners", said Gerhard Janetzky. It starts in front of the Olympic Stadium and passes Berlin's most famous landmarks like the Brandenburg Gate, Unter den Linden, Friedrichstraβe, Potsdamer Platz and Kurfürstendamm. The course is also fast: Paul Kosgei ran the current world record of 1:12:45 on it in 2004. Besides the 25km a 5km walking and Nordic-Walking event will be staged on 4 May, along with races for children and juniors – all finishing inside Olympic Stadium. Eight AIMS marathons took place in four continents on Sunday 7 October, as the season's busiest month gets underway. The Samsung Melbourne Marathon (more) in Australia was followed by Europe's oldest, the Kosice Peace Marathon (more) in Slovakia (founded 1924) and then Baxter's Loch Ness Marathon (more) in Scotland. In North America the Medtronic Twin Cities Marathon (more) and the Portland Marathon (more) were held in USA while over the border in the Canadian province of British Columbia the Okanagan Marathon (more) and the Royal Victoria Marathon (more) were run. Still on the Pacific Coast, but way down south in Ecuador, the Guayaquil Marathon (more) took place for the third time. In the real,- BERLIN-MARATHON on 30 September Haile Gebrselassie took 29 seconds off the world marathon record, with a time of 2:04:26. Within 10 minutes of the finish Gebrselassie received a congratulatory call on race director Mark Milde's telephone from his friend and rival Paul Tergat, whose record he had just broken. "That's sport, records are made to be broken" said Tergat. "I'm happy for him, we are good friends". It was four of Tergat's fellow Kenyans — Rodgers Rop, Wilson Kigen, Andrew Limo and Peter Kiprotich, with Ethiopian Eshetu Wondimu — who had paced him as far as 30km. No one else tried to follow, even in the first few kilometres. His group was four seconds clear after 2km, 12 seconds clear at 5km, 24 seconds ahead at 10km and a full minute at 17km. Gebrselassie was on target for just inside Tergat's time, set on this same course in 2003, but at halfway he had slipped outside it. Two of his escorts dropped out and the pace slowed slightly through to 30km, although this part of the course rises a little. After 30km Gebrselassie was on his own, and he needed to speed up to get the record. As the sun finally penetrated the leaden skies and the course tilted downhill slightly he did so, running 2:56 and 2:55 for the next kilometres. Haile Gebrselassie sets a new world record in Berlin. 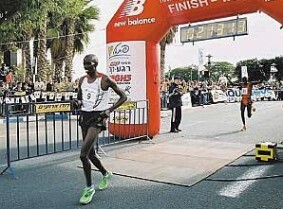 (Click to enlarge) Although Gebrselassie afterwards said he was confident of breaking the record from the halfway point, to anyone observing it still did not look like a safe bet at 35km where, although still ahead of Tergat's schedule, his own pace suggested a finish just outside the record. Last year Gebrselassie had been in the same situation, but had run the first half much faster and then suffered in the final 5km, losing more than a minute. This time he had judged his effort much more finely, and was running around 2:52/km over the last 5km, which brought him under the Brandenburg Gate with 2:03:27 on the clock and 350m to run. "This was something special," said the 34 year old Ethiopian. "The conditions today were perfect". After heavy rain on Saturday, it was 14°C at the start, rising to 18°C at the finish shortly after 11:00. It is the 24th record of Gebrselassie's career. Haile Gebrselassie finally fulfilled his dream of breaking the World record at the real,- Berlin-Marathon (more), on 30 September with a time of 2:04:26 (see item above). The Lake Tahoe Marathon had taken place the day before, on 29 September, and also featured a triple-marathon ultra race. Budapest held its second AIMS race of the month on 30 September as the 22nd Plus Budapest Marathon (more) followed the Nike Half Marathon held four weeks earlier. Not far away another high-quality field contested the 46th Dexia-Bil Route du Vin Half Marathon (more) in Luxembourg. Back in North America to round off the weekend programme, the Scotiabank Toronto Waterfront Marathon (more) recorded the first sub-2:10 marathon performance (in fact two of them) in Canada since Waldemar Cierpinski won the 1976 Olympic Marathon title. This year's real,- Berlin Marathon on 30 September will be keeping closer tabs than usual on one of the runners' main enemies: the weather. Detailed recordings of temperature, relative humidity and wind speed will be made using five mobile measuring instruments along the race route between 08.00 and 15.00. The information will be analyzed to determine what effect it may have had on the performance and on the health of runners. On the basis of this pilot study future participants in the real,- Berlin Marathon could enjoy specific detailed warnings of weather conditions and their likely impact on the runner during the race, as well as medical provision more specifically focused on the problems which are likely to arise. Former Boston and Chicago Marathon Champion Svetlana Zakharova will run the Dresdner Kleinwort Frankfurt-Marathon on 28 October as her comeback after childbirth. For the 36 year-old Russian, with a 2:21:31 personal best, it will be her first marathon since November 2005. Although she is the fastest woman runner who has yet entered the race she will face tough opposition from another new mother, the Kenyan Ruth Kutol. Since completing her maternity leave this year she has run 1:12:56 in the Half Marathon of Portugal on 16 October. A record field of more than 11,000 marathon runners is expected for this 26th edition of the race, along with other running events a total of 17,000 people are expected to take part. The Sydney Marathon (more) was run on Sunday 23 September as part of the Blackmore's Sydney Running Festival, with all races featuring a crossing of the famous Harbour Bridge. European AIMS races that day were the Hans Christian Andersen Marathon (more) in the Danish town of Odense (including a women-only half marathon event), the Baltic Marathon & 10km, Estonia (more) in the Estonian capital Tallinn, and the Turin Half Marathon (more) in Italy. The Canadian province of New Brunswick was the location of a new AIMS member event, the Marathon By The Sea. The RTP Half Marathon of Portugal (more) started mid-span on the 20km-long Vasco da Gama Bridge across the Tagus estuary on 16 October, finishing on the Lisbon (west) side. This year's date is two weeks earlier than normal to avoid clashing with Portugal's assumption of European Union Presidency. Ten time zones later the Maui Marathon was held in the Hawaiian Islands (USA). The Times of India Bangalore Marathon (IND), originally scheduled for 16 September, has been postponed until 28 October. The autumn running season really got under way on Saturday 8 September, with the Jungfrau Marathon (more) in the Swiss Alps, the Ruska Marathon (more) in Finland, the Vilnius Marathon in Lithuania and the Novosibirsk Half Marathon (more) in Russia. The following day the Moscow International Peace Marathon and the Hokkaido Marathon (more) were run, and four half Marathons: the Pila International Half Marathon (more) (POL), the Reebok Bristol Half Marathon (more) (GBR), the Buenos Aires City Half Marathon (ARG) and the Media Maraton Internacional Ciudad de Medellin (more) (COL). There are two fewer races than originally scheduled as the Toyota Great Ethiopian Run has been postponed to 25 November and the International Ghazi Run 10km in Turkey will now be held on 28 October. The 7th TOYOTA Great Ethiopian Run, which was to be held Sunday 9 September as part of Ethiopia's Millennium celebrations just three days before the Ethiopian New Year, has been postponed at the request of the Ethiopian Government. More than 30,000 participants, many hundreds from abroad were to run the 10km race and a further 3,000 youngsters the children's races. Ethiopia's Vice Prime Minister informed race patron Haile Gebrselassie of the news just 13 days before the competition. Gebrselassie held a face-to-face meeting with the Vice Premier but the decision to postpone the event was confirmed. Gebrselassie expressed his profound disappointment: "This does not reflect well on our country and sends out the wrong messages. I feel very sad about this decision and what it means for so many people connected with our event." A new date of Sunday 25 November 2007 has been set for the race. On the first day in September the Ruta de las Iglesias 10km (more) race took place in torchlight at 19.00 in the Ecuadorian capital, Quito. By then it was already 05.00 on 2 September in Osaka, where the women's Marathon of the XI IAAF World Championships in Athletics (more) started two hours later at 07.00. Later in the day a trio of Half Marathons were held: The Nike Budapest Half Marathon (more), the Fresh 'n' lo Great Scottish Run (more) in Glasgow, and the Rio de Janeiro Half Marathon (more). The men's marathon opened the programme of the XI IAAF World Championships in Athletics (more) at 07.00 on 25 August, and there was limited action elsewhere. Later that day in Greenland the Nuuk Marathon (more) took place, with the Victoria Falls Marathon in Zimbabwe, the SSQ Quebec City Marathon (more) in Canada and the Maraton de la Ciudad de Mexico (more) all were held the next day. The Medtronic Twin Cities Marathon, to be held on 7 October will support USA Track and Field's "Zero Tolerance" anti-doping policy by voluntarily testing an increased number of elite athletes. USATF selected the associated 10 Mile event, which incorporates the 2007 USA Men's 10 Mile Championship, as part of its program to test elite athletes competing at championship events. The athletes tested will be randomly selected by the US Anti-Doping Agency (USADA) and costs (between $300-$500 per athlete) will be supported by USADA and the US Olympic Committee. "We support these efforts to keep running clean", said Twin Cities Marathon race director Virginia Brophy Achman. "Testing for performance enhancing drugs sends the message that runners can expect a fair competition. Doing this is part of the responsibility of operating a successful, respected event that supports true athletic ability." Two Nordic Marathons took place on Saturday 18 August in the capital cities of Finland and Iceland: the Helsinki City Marathon (more) and the Glitnir Reykjavik Marathon (more). With AIMS events staged in the east and west hemispheres last weekend, it was the turn of the north and south hemispheres on Sunday 12 August. In Australia the Sun-Herald City to Surf (more) was run from Sydney city centre to Bondi Beach over a challenging 14km course and, 17 time zones further west, the ING Edmonton Marathon (more) took place in Canada. Two AIMS events were held in widely separate locations on the first weekend in August, with the Siberian International Marathon (more) being held in Omsk on Saturday 4 August, followed by the Panama City International Marathon (more) on Sunday. The 2007 Scotiabank Toronto Waterfront Marathon will be the first ever Canadian marathon to be broadcast live. CBC Country Canada, the Canadian Broadcasting Company's digital channel that recently broadcast the FIFA U-20 World Cup, will provide four hours of live coverage on 30 September. Live internet coverage will be available on cbcsports.ca, for five hours. A one-hour "Highlights" program will be presented six days later during CBC Sports Weekend on Saturday afternoon, 6 October. Scott Moore, executive director for CBC Sports said: "This is one of Canada's top marathons, and an important community event. We are committed to providing the best sports coverage, and we are proud to bring the Scotiabank Toronto Waterfront Marathon into Canadian homes coast to coast." "This is the final piece we needed to create a truly international-class marathon in Toronto" said race director, Alan Brookes. More than 12,000 runners from 30 countries and 40 US states are expected to participate in this year's event. Champion Daniel Rono returns to attempt the fastest marathon ever on Canadian soil (to which end he would have to beat Waldemar Cierpinski's Olympic time of 2:09:56 from the 1976 Montreal Games). Ethiopians Asha Gigi and Merima Denboba will challenge last year's women champion Malgorzata Sobanska and hope run under 2:30. Canadian marathon celebrity, 76-year-old Ed Whitlock, will attempt a new age-group world record. The First Marathon Race Ever; the evolution of the event in the beginning of the last Century and its impact on today’s Marathons. The Transition of the Marathon - from a purely competitive event into a popular running festival open to everyone – and the consequences for the running community and the event organisers. The Economic Impact of Marathons - on their organising cities and local communities. improvements of services provided to the runners. The Symposium will open at 12:30, following the Athens Classic Marathon Opening Ceremony at the Marathon Tomb. The Symposium will be concluded at about 18:00. 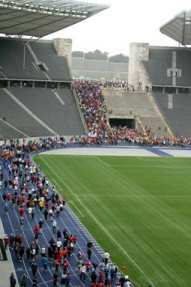 Symposium participants are also invited to attend the start and finish of the Athens Classic Marathon to be held next day, on 4 November 2007. The AIMS Marathon Symposium Organising Committee offers free full-board accommodation (from 2-5 November) to one participant per race (regardless of whether they are members of AIMS). 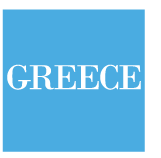 Delegates will be met at Athens Airport and local transportation will be provided. Race organisers interested in participating in the Symposium may be represented by more than one delegate if they bear the cost. 1992 Olympic 5000m champion Dieter Baumann will run the Dresdner Kleinwort Frankfurt Marathon on 28 October. In 2002 he made his highly anticipated marathon debut in Hamburg, but gave up after 34km. He officially retired four years ago: "today I am a fun runner," the 42 year-old explains, but "I still like running fast." Asked what "fast" would be Baumann replied that a time of 2:40 should be possible. Running for various charities he will collect 1,000 Euros (US$1,350) for each minute he goes sub-3 hours. If he could run 2:40 on the flat course of the Dresdner Kleinwort Frankfurt Marathon he would generate 20,000 Euros. After a two-week hiatus AIMS action resumed on Saturday 21 July with the Great Tibetan Marathon (more) in Ladakh, India (otherwise known as "Little Tibet"). The Arctic Marathon, previously scheduled for 26 July - 4 August, will not now take place this year. There followed four races on the last weekend in July: the Swiss Alpine Marathon Davos (more) (actually 78km, although 42km and 21km options were offered) and the Africa University Peace Marathon in Mutare (ZIM) on Saturday 28 July, followed the next day by the Media Maraton Internacional de Bogota (more) (COL) and the San Francisco Marathon (more). The Zermatt Marathon (more) took place on Saturday 7 July, high up in the Swiss Alps. Next day action switched to North America where the HSBC Calgary Marathon (more) was run, followed by the Virginia Mason Team Medicine Marathon (more) at Seafair, in Washington State. They have the world's only seven-star hotel; now they've got the world's only 24 world-record runner writes Pat Butcher. Fresh from his two most recent world bests, last week, Haile Gebselassie of Ethiopia has announced that he will compete in the next Standard Chartered Dubai Marathon on 18 January 2008, his last marathon before the Beijing Olympic Games in Beijing next summer. "Having Haile agree to run in Dubai takes the event to a completely new level," said Dubai race director, Peter Connerton. The event was recently upgraded, with the injection of a one million US dollars prize pot, with both men's and women's winners taking away $250,000 (double the biggest prize elsewhere). There is an additional one million dollars on offer from Dubai Holding to anyone (man, woman or both) breaking the marathon world record. Haile's old rival, Paul Tergat of Kenya holds the men's record, with 2:04:55, while Britain's Paula Radcliffe has the women's record of 2:15:25. 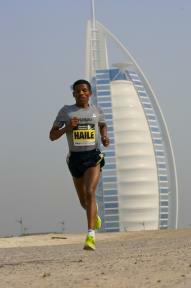 "I still have ambition," said Haile, after a morning trot along the sand near the Dubai landmark, the Burj Al-Arab hotel. "My aims are to break the marathon world record, and win the Olympic Games marathon. I'd like to break the world record here in Dubai, and my training towards that begins tomorrow." On June 27 in Ostrava (CZE) Gebrselassie ran 21,285m in the hour, having recorded 56:25.98 for 20,000m en route. They were his 23rd and 24th world records or bests. His marathon best is 2:05:56, set when winning Berlin in 2006, making him one of only five men to have run under 2:06. He returns to compete in this year's real,-Berlin Marathon on 30 September. The Vivovdan 10k (more) road race took place in Bosnia on June 28. Two marathons took place in Finland on Saturday 30 June: the Santa Claus Marathon (more) (Rovaniemi) and the Paavo Nurmi Marathon (more) (Turku) . The Tallinn Marathon, which was due to take place in Estonia, was cancelled because of objections from the Tallinn City authorities. On 1 July the Gold Coast Airport Marathon (more) was held in Australia, followed by the British 10km London (more). During the following week the 100 miles of the Namib Desert (more) was run over four days (and five stages), from 2-5 July. 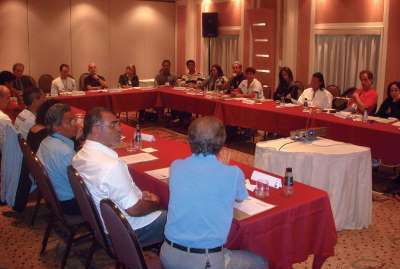 AIMS has agreed a memorandum of understanding with IAAF, SEGAS (the Greek National Athletics Federation) and the town of Marathon to promote an AIMS Marathon Symposium on 3 November 2007 and annually thereafter, to be held in the town of Marathon, one day before the Athens Classic Marathon. The symposium would last 4-6 hours and be addressed to current and future Marathon organisers and other interested parties. The aim is to encourage close co-operation and exchange of views on issues of mutual interest which will assist organisers in their constant efforts to improve their races. The organisation of an Annual Symposium at the birthplace of the Marathon also raises significant symbolism related to World Peace, Olympic Ideals and Fair Play. Four keynote speakers will be invited to address the theme Marathon past, present and future in two sessions. Invitees will include AIMS and IAAF officers and representatives, race directors from around the world, renowned former or still-active marathon runners, and media representatives. The organisers offer hospitality to attendees within these categories which would include lodging in Marathon. By the end of July, the organisers will send out all information necessary concerning the registration procedure. This information will also be posted on the website of the Athens Classic Marathon (www.athensclassicmarathon.gr) and on the AIMS website (www.aims-worldrunning.org). Lake Myvatn Marathon (more), in central Iceland, was held in its traditional Friday evening slot on 22 June. Another round-the lake tour started action on Sunday 24 June at the Lake Saroma 100km (more) race in Japan. Later that same day marathons were held in Rio de Janeiro (more) and San Luis Potosi (Tangamanga Marathon) (more) in Mexico, before the day concluded with the Scotiabank Vancouver Half Marathon (more). A recent study by George Washington University International Institute of Tourism Studies has found that Washington DC benefited from $31.7 million in spending over the Marine Corps Marathon weekend during October 2006. Runners and spectators were randomly interviewed to determine that more than 96,000 people came to the area as a part of the race weekend. Their spending was 62% up on 2004, and more than 160% up on 2002. Marathon visitors over the average three-day stay paid for food, lodging, entertainment, local transportation and retail purchases, which generated more than $2.2 million in tax revenue - up 69% from 2004. These findings come in the wake of a formal marketing partnership between the Marine Corps Marathon and Arlington County which is intended to enhance the economic and tourism opportunities generated by the race. This programme includes joint promotional ventures - most prominently the creation of a new "Finish Festival". "As a host and partner of the Marine Corps Marathon, we're very proud to welcome runners, race officials, visitors and other guests to Arlington for this popular marathon" said Arlington Board Chairman Paul Ferguson. "Our entire community benefits greatly from the marathon, enjoying both cultural and economic gains from the race." Runners and their parties spent more than $16 million over the weekend. Their average 3.1 night stay generated another $10 million in revenue. As well as the economic impact, the race provides the means for more than 3,500 charity runners to raise more than $5 million for local and national causes. The Marine Corps Marathon is primarily a domestic event (no prize money is offered), and receives only limited entries from foreign runners, who characteristically spend far more during their visit. A proportionately greater economic impact may be experienced by marathon races that attract a higher proportion of foreign runners. Following the economic impact statement from the Marine Corps Marathon, the Rock 'n' Roll Arizona Marathon released data showing that their fourth race, in January 2007, generated an estimated $44 million for the state's economy. This figure was derived from an economic impact study funded jointly by the race and the State office of Tourism, and was carried out by the Arizona Hospitality Research & Resource Center at Northern Arizona University in Flagstaff. More than 34,000 runners registered contributing more than $2 million in tax revenues. This level of spending produced an employment impact of 1,230 jobs within local county. An earlier study estimated the economic impact of the 2004 race at $41 million, including $1.1 million in tax revenues. More than half of the runners were from out-of-state, which means that a significant number of race participants were spending money on hotels, food, shopping and other items. Over 21% of out-of-state respondents reported traveling outside Phoenix during their stay, significantly up on the 17% quoted in 2004. As the solstice approached the Midnight Sun Marathon (more) was held on 16 June in Tromso, Norway (70N). The next day, in lower latitudes, the Dalian International Marathon (more) (CHN) and the Laguna Phuket International Marathon (more) (THA) took place, followed by South Africa's Ultramarathon Classic the Comrades Marathon (more), contested over a distance of 89km by 12,000 runners. The Stockholm Marathon (more) was run on Saturday 9 June over a two-lap course that finishes inside the 1912 Olympic Stadium. The Hawaiian Half Marathon, previously scheduled for 10 June, has been cancelled. Twenty participants from 17 countries attended the Road Course Measurement Seminar held in the IAAF Regional Development Center (RDC) in Cairo from 3-5 June reports Sean Wallace-Jones. The accurate measurement of road courses is one of the fundamental requirements for IAAF approval and a condition of AIMS membership. document that measurement. Africa lacks qualified measurers and this seminar for measurers from the Arab-speaking countries was part of the IAAF response to this need. IAAF/AIMS measurer Hugh Jones, General Secretary of AIMS (Association of International Marathons and Distance Races), who is the International Measurement Administrator for English speaking Europe and Africa, was the course lecturer. Participants had various degrees of experience, but all were taken through the full range of procedures required to accurately measure first a simple and then a more complex course and a typical "lap" as used for race walking competitions. After a brief explanation of the principles of course measurement, the first step was to fit the ubiquitous Jones/Oerth counter to the bicycles. The counter is the essential tool of road course measurement, providing an extremely accurate reading of distance when correctly calibrated. This is done by means of a calibration course - a flat piece of road with a similar road surface as the course to be measured, that has been measured using a steel tape to determine its exact length. The bicycle wheel is placed over the starting point (a nail driven into the ground) and the bicycle is ridden in a straight line to the end of the calibration course. The number of counts registered during this ride is noted before returning to the starting position and again noting the number. This procedure is repeated. The average number of counts registered during one ride is divided by the length of the calibration course (in this case 350m) and yields a "constant" indicating the number of counts registered for each metre. This number is then multiplied by 1.001 to build in a correction factor which accommodates the known margin of error in the measurement method. 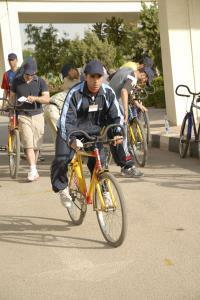 After calibrating their bicycles, participants then measured a straight forward course, with step-by-step tuition through all the procedures needed to achieve an accurate result, including re-calibrating the bikes after the course measurement to account for any change in conditions during the measurement. The initial "working" constant and the later "finish" constant are averaged to produce the figure to be used in the final calculation of the course distance. With these elementary procedures well instilled in the students, the course ended with the more complex task of measuring a 2km lap course, where they learnt the principles of creating a course with a precise length, requiring the adjustment of start and finish points and the calculation of turns. Following the completion of the course, Hugh Jones commented to the IAAF RDC Cairo Director Dr Abdel Rahim Hamdi: "I think that the seminar went well, despite my early fears over the number of those participating. It was a difficult task to manage so many people but proved possible because of the excellent facilities and organisation, and also because of the attitude, attention and aptitude of the participants." I felt that they came away with a working knowledge of how to measure a road race course and that they would be able to do this if given the possibility. Of course, it is always different to work in the "real world" (with traffic!) than it is in a seminar situation, but I think the group have a solid understanding of the principles to follow, and may be able to apply them. A number of the students show every indication that they will go on to become accredited measurers, and I hope that this will indeed happen. Recognition also came for the great help provided by the RDC Director and his Staff: "The success of the seminar was in no small part down to the help given by you and your staff - the translators, the bike mechanics and the backroom administrative staff." Freihofer's 5km Run for Women (more) took place on Saturday 2 June in Albany, the capital of New York state and again features some of the fastest women in he world at the distance. Sundays action started with the Zelenograd Half Marathon Sprandi (more) in Russia, which was followed by the Sao Paulo Marathon in Brazil (more) and the Quito Ultimas Noticias 15km in Ecuador. Two AIMS races were held on Sunday May 27, the Edinburgh Marathon (more) in Scotland followed by the ING Ottawa Marathon (more) in Canada . Additionally, the Italian Half Marathon Championships (more) were held as a test event on the same course in Udine (ITA) that will be used for the 2nd IAAF World Road Running Championships on 14 October. The second event in the AIMS Children's race series was held in Rwanda on 13 May in conjunction with the Kigali Peace Marathon. 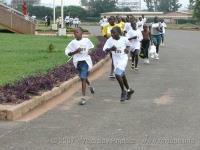 More than 1200 children registered for the 5km fun run in which they ran alongside people of all ages. (Click to enlarge) They started from within the national stadium, and ran pell-mell for the exit gate to start their circuit of the surrounding streets in the outlying district of the Rwandan capital. The race attracted a lot of support from the crowd along the route. The circuit included some inclines, made more taxing by the moderate altitude, but even the smallest children seemed to complete the entire course without stopping or walking. (Click to enlarge) The final part of the lap involved circling the stadium on the road outside before entering the arena to run the final 300m on the track. The popularity of the Kigali event was such that only one age group, 10-11 year olds, was included within the Children's race and others entered individually for the fun run. Children were entered through their schools, and some of them travelled long distances to reach the capital, and had to stay overnight to be able to participate in the race. www.rexlaus.info Chip timing allowed easy identification of the category winners - and top 10 finishers in both boys and girls categories were presented with running shoes and sports bags supplied by courtesy of ASICS. Two AIMS races were held on 19 May and three on the following day: the Great Wall Marathon (more) in China and the Three Hearts Marathon (more) in Slovenia took place on Saturday while these were followed on 20 May by the Nordea Riga Marathon (more) in Latvia, the Glitnir Copenhagen Marathon (more) and the Media Maraton Ciudad de Valencia (more). Australia’s Canberra Marathon initiative of utilising a weekly running programme in schools to encourage a healthy lifestyle in children has successfully claimed the inaugural World AIMS/ChampionChip* Award for Innovation in road running <more>, securing a prize of US$10,000. The Canberra Kids Marathon encourages school age children to complete the 42.195km marathon distance over a number of weeks. A basic program is to run 1km each day from Monday to Friday for eight weeks. This can be done in the child's own time or as part of a school or sporting club programme. The innovative Australian programme defeated strong competition from the 235 races across 85 countries in AIMS Association of International Marathons and Road Races membership. 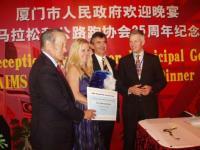 (Click to enlarge) Cees Verhoef, Chief Executive of sponsors ChampionChip, proudly presented the award to Canberra Marathon organizer Fran Seton at the 16th World Congress of AIMS, recently held in Xiamen, China. The programme, designed to encourage a healthy lifestyle and social responsibility, is run in association with the Australian Institute of Sport and is part of a wider schools-based initiative, raising funds for the Children’s Cancer Institute of Australia. Those involved also establish ‘pen friends’ in USA as a result of close links with the Los Angeles Marathon. The popularity of the initiative meant that record-breaking figures registered for this year’s event with 310 children representing a 38 per cent increase on numbers in 2006. The Canberra Marathon itself attracted over 1000 entrants and was held over the weekend of the 14-15 of April. (Click to enlarge) Co-Race director Fran Seton was delighted by the achievement and commented: ‘For Canberra to get this international recognition is fantastic. The event was successful in encouraging young people to participate in sport. *The ChampionChip is a miniature transponder in a specially designed light packaging, marked with a unique identification number. It has revolutionised timing systems for sport with hundreds of thousands of runners around the world, running with the confidence of an accurately recorded time of their personal performance awaiting them at the end of their chosen race. The Goteborg Half Marathon (more) started off another weekend of spring AIMS activity in Europe on 12 May. The following day the Karstadt Marathon (more) and iWelt Marathon Wuerzburg (more) were held in Germany, the Volkswagen Prague Marathon (more) in the Czech Republic and the Pisa Marathon (more) in Italy. 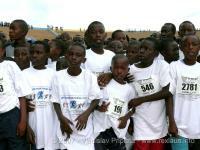 Elsewhere the Kigali Peace Marathon (more) was run in Rwanda, on the same day as the AIMS Children's Series event there. The second race of the AIMS Children's Series for 2007 takes place in Kigali (Rwanda) on 13 May in conjunction with the Kigali International Peace Marathon, to be held for the third time. It follows the successful staging of the Children's races at the Sahara Marathon in Tindouf, Western Sahara, on 27 February. The events in Rwanda are organised through the Ministry for Youth, Sport and Culture (MIJESPOC), representatives of the Olympic Committee (CNOSR) and the Rwandan Athletic Federation (FRA). The races enjoy the support of Soroptimists Europe (SIE) and the marathon club of Luxembourg (ASMK) which has established a special friendship with the Kigali Marathon. In 2006 a total of 1800 runners from 21 different nations came to Kigali, and the organisers hope to surpass this number this year. In the children's series there will be races for up to 1200 boys and girls in three different age categories. The event is held under the auspices of President Paul Kagame. 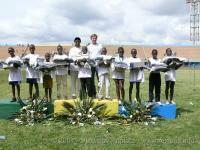 The final event of the AIMS Children's Series 2007 will take place in Addis Ababa on 8 September. AIMS became 25 years old on 6 May 2007. The Association was founded at the Establishing Congress, held at the Park Lane Hotel in London on 6 May 1982, with an initial membership of 28 race directors. The Association has since burgeoned to almost ten times the size at foundation, now counting 240 members in 85 territories throughout the world. To mark the occasion of the 25th anniversary of the founding of the Association, a Silver Jubilee brochure has been produced, which is currently being distributed to members, but which can also be viewed and downloaded by clicking the front cover image placed in the left hand column of this web page. Europe continued to be the main focus of AIMS activity on 6 May, with marathons held in Krakow (Cracovia Marathon (more)), Trieste (Maratona d'Europa (more)), Geneva (more) and Vittoria (Maraton Martin Fiz (more), incorporating the Spanish Championships), as well as the classic RunBerlin 25km (more). Elsewhere the Medio Maraton de Quito 2800 (the number indicating the altitude) and the BMO Vancouver Marathon (more) rounded off the action. The Napa Valley Marathon has become the latest race to indicate that it will actively enforce the new US Federation rule that bans personal music players during races. The rule [144.3(b)] was enacted at the USATF convention in December 2006, says "The visible possession or use by athletes of [offending devices listed] in the competition area shall not be permitted." USATF had justified the rule change by stating: "the huge proliferation of MP3 players and other audio devices using headphones by road race participants constitutes a safety hazard. These devices can prevent runners from hearing critical instructions from course monitors, police, and other race officials. 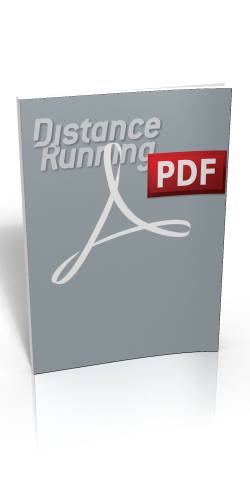 Many race directors are reluctant to prohibit these devices in their races for fear of losing entrants. A firm prohibition by USATF will make it easier for these directors to justify bans on these devices in their races." Grandma's Marathon had earlier announced that it will enforce the electronic device/headphone restriction for its 16 June event, in which more than 9,500 runners participate. The Napa Valley Marathon, which next takes place on 2 March 2008, will advise on their entry material against bringing personal electronic devices with headphones to the race. Athletes carrying these devices will be asked to surrender them to an official before the race, and they will be returned to their owners afterwards. Participants who violate the headphone ban risk disqualification and their names being deleted from the race results. "We totally support USATF's ban on the dangerous practice of headphone use in road races," said Rich Benyo, co-director of the Napa Valley Marathon. The rule had previously applied to USATF sanctioned track events and merely strongly suggested the prohibition in distance races on road and country. Similar prohibitions on the use of headphones in road races are also being considered in other countries. AIMS Marathons continued in Europe on 29 April in Vienna (more) and Hamburg (more). In France a popular Half Marathon was held in Nice (more), and on the west coast of the USA the Big Sur Marathon (more) was run over a famously scenic course. Europe was the focus of AIMS activity on 22 April, when five marathons took place - in Wroclaw (POL), Belgrade (more) (SRB), Padua (more) (Maratona Sant Antonio), Enschede (more) (NED) and Madrid (more). The Standard Chartered Dubai Marathon is offering $1,000,000 in prize money and another $1,000,000 as a world record bonus for the next edition of the race in January 2008 writes Pat Butcher. This makes it the richest long distance running event in history. Male and female winners will receive $250,000 each, double the current leading marathon prize of $125,000 offered by the Chicago Marathon. Winnings in Dubai are tax-free. Race patron HH Sheikh Mohammed bin Rashid Al Maktoum, Vice President and Prime Minister of the UAE, Ruler of Dubai took this initiative in order to elevate the 10-year old event to the status of other multi-million dollar sports events in Dubai, such as the Dubai World Cup horse race, the Dubai Desert Classic golf tournament, and the Dubai Tennis Open. This year's Dubai race, on a new course which goes past the celebrated 7-star Burj Al Arab hotel, was won by William Rotich in 2:09:53. He said "I think with the right people and pacing, someone could do 2.05 here". Paul Tergat's world record is 2.04.55. Askale Magarska of Ethiopia ran a new course record of 2:27:19 this year. Paula Radcliffe's world record is 2:15:25. After Easter weekend a glut of races took place on Sunday 15 April. Canberra (more) (AUS) was first off, followed by the Nagano Commemorative Olympic Marathon (more) in Japan, and then the Turin (more), Paris (more), Rotterdam (more) and the Carlos Lopes Gold Medal Marathon (more) (Lisbon) in Europe. Finally the Sao Paulo Half Marathon Corpore (more) and the Vancouver Sun Run (more) completed the set of eight AIMS races spread throughout five continents. On Monday 16 April the BAA Boston Marathon (more) held its 111th edition. The Two Oceans 56km (more) race took place as usual on Easter Saturday in Cape Town, but it is coincidental that the North Pole Marathon also took place on 7 April. Next day the Tarsus international Half Marathon (more) was run on Turkey's Mediterranean coast. 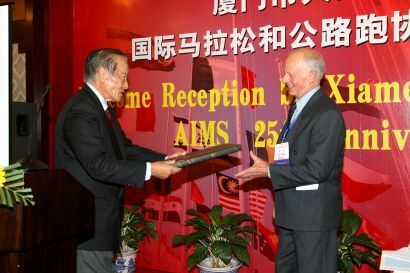 On the eve of the 16th World Congress of AIMS, being held in Xiamen (CHN) the association held a celebratory dinner jointly with the Xiamen Sports Bureau at which the guest speakers were Luo chao yi, Vice President of the Chinese Athletic Association and Andy Galloway, founder member and former General Secretary of AIMS. AIMS President Hiroaki Chosa made a presentation to Andy Galloway in appreciation of his formative role in the history of the Association. The evening also showcased the inaugural presentation of the AIMS/ChampionChip Award for Innovation (more), Which was won by the Canberra Marathon for the innovative programme by which they encouraged participation of children. Fran Seton accepted the award from the Chief Executive of ChampionChip, Cees Verhoef. The first day of the Congress included the backstage story of how the Tokyo Marathon launched itself from an elite race of only 100 runners to a mass-participation event with a cast of thousands. Completing an Asian trilogy, the Congress delegates also heard how running in India has hit the big time, embraced by Government and Bollywood alike. 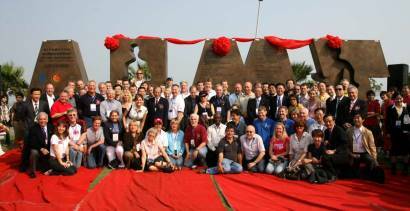 In the afternoon delegates assisted in the unveiling ceremony of a massive stone sculpture which was erected to mark the holding of the 16th World Congress of AIMS in Xiamen. Associated bronzes of 99 life-size runners trail back along the seafront, giving the appearance that a race is permanently in progress. The second day of the AIMS Congress was spent enacting the business of the Association. The audited accounts for 2005 and 2006 were presented, followed by reports on membership and technical matters, Distance Running, public relations, the AIMS Children's series (past, current and following year), and the AIMS website. Various changes were made to the Articles of Association, including changing the title of the organisation from the Association of International Marathons and Road Races to the Association of International Marathons and Distance Races. Hiroaki Chosa was re-elected as AIMS President. Paco Borao was elected Vice President, Al Boka Treasurer and Horst Milde, Vivek Singh and Martha Morales as Board members. The venue for the 17th World Congress of AIMS, to be held in April 2009, will be Sao Paulo, Brazil. The Xiamen International Marathon (more) was run on Saturday 30 March, immediately following the 16th World Congress of AIMS held in the Xiamen Convention centre, located right beside the start and finish line. Sunday 1 April, the Chunju Marathon (more) (KOR) and the Zurich Marathon (more) were run, along with the Vattenfall Berlin Half Marathon (more) and the Edinburgh Forthside Half Marathon (more). On the same weekend as the IAAF World Cross-Country Championships (more) in Mombasa, only two AIMS races were held: the Hervis Prague Half Marathon (more) (CZE) on 24 March, and the Novi Sad Half Marathon (more) (SRB) on 25 March. The mayor of the Greek town of MARATHON (population 17,000), Spyridon N. Zagaris, visited the Sports Museum in the Berlin Olympic Park on 16-17 March. The Museum also bears the name "AIMS Marathon-Museum of Running", which AIMS bestowed upon it in 1994. At the Olympic Games in Athens in 2004, the International Olympic Committee (IOC) created a marathon museum in Marathon, the original Greek settlement that gave its name to the classic long distance race. Numerous exhibits from the IOC document the history of the Olympic marathon races since 1896. Horst Milde, long-time race director of the Berlin Marathon and a member of the AIMS Board of Directors, visited the museum at Marathon during the 2004 Olympic Games. On his return visit Spyridon Zagaris arrived in Berlin with a large delegation from Marathon, and presented the Berlin Sports Museum with an olive wreath rendered "metallic" by dipping it in a bronze alloy. In the future, the idea is to ignite a flame at the grave mounds in Marathon, which would be brought to select major marathons as a symbol of freedom and peace. The metallic olive wreaths from Marathon would then be given to the gold, silver, and bronze medal winners at the awards ceremonies. As is already the case with the classic marathon in Boston, MARATHON hopes to arrange a city partnership with Berlin. A busy weekend began in the east with the Kuala Lumpur International Marathon (more) in Malaysia and the Seoul International Marathon (more) in Korea on Sunday 18 March. A few hours later, in Europe, the International Oger Antalya Marathon (TUR), the City of Rome Marathon (more) , and the EDP Half Marathon of Lisbon (more) followed on. The Standard Chartered Stanley Marathon (more) , in the Falkland Islands, was the last event of the day, but on Monday 19 March Jerusalem City Council staged the 15th Jerusalem Half Marathon. 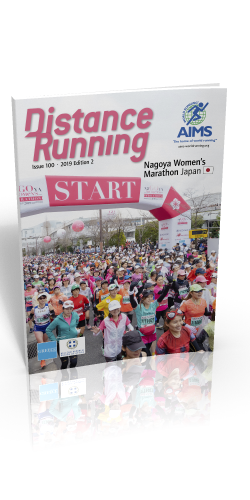 It was a quiet weekend for AIMS races, with two events held in Japan on Sunday 11 March: the Nagoya International Women's Marathon (more), and the Kyoto City Half Marathon (more), followed by the Vigarano Marathon (more) in Italy . The Sports University of Cologne is currently collecting data through an online survey on running performances, training regimens, and health and lifestyle factors relating to endurance athletes. They seek input from runners via an anonymous questionnaire <here>. Every participant in the survey receives an automated analysis of their personal performance and the possibility to compare their results with up to 400,000 others collected for the marathon and half-marathon distances. Results are continuously accessible to the public. The anonymously collected data will be of interest to the runner, the scientist, and also to race organizers. Feel free to contact the survey organisers at pace@dshs-koeln.de if you have any questions. The busiest day of the year so far saw marathons held in four continents and a stage race started (over a total distance of 100km) on 4 March. The Lake Biwa Mainichi Marathon (more) in Japan and the Standard Chartered Hong Kong Marathon (more) were held in Asia, the Kilimanjaro Marathon and 100km del Sahara (TUN) took place in Africa, the Marato de Barcelona was run in Europe and the Maraton Lala Internacional (more) (MEX) and Los Angeles Marathon (more) were held in America. The Philippines Marathon - Pasig River, the Verdi Marathon (more) (ITA) and the World's Best 10K (more) (PUR) were all held on the final Sunday of February. The Sahara Marathon (ALG) took place on Monday 26 February. The Sahara Marathon, held in Sahrawi refugee camps, also hosted the first event in the 2007 AIMS Children's Series. The Antarctica Marathon (more) was held on Tuesday 27 February. AIMS races were run on three consecutive days as the Egyptian Marathon took place in Luxor on Friday 16 Feb, the Dead Sea Half Marathon (more) was run in Israel on Saturday 17 February, and the new mass-participation Tokyo Marathon (more) was held on Sunday 18 February, the same day as the Marathon Popular de Valencia (more), in Spain. The Maraton Ciudad de Sevilla (more) was held on 11 February. "New world half marathon record"
Wanjiru, just 20 years old, clocked 58:53 and recaptured the world record that Haile Gebrselassie had taken from him a year ago by running 58:55. Wanjiru had set the previous record a year before that, when still a junior, with 59:16 in Rotterdam. Gebrselassie's record, was set in a paced, solo run, whereas Wanjiru dismantled one of the best fields ever assembled thanks to the record overall prize money of $155,000 on offer in Ras Al Khaimah. Youngest in the field, Wanjiru was up against world champion, Fabiano Joseph of Tanzania and Robert Cheruiyot, winner of the Boston and Chicago Marathons. Undeterred, he shot to the front to lead a group of 15 through 5km in a startling 13:27. The second 5km was covered in 14:20, for an outrageous 10km split of 27.47. By this time Wanjiru headed fellow Kenyans, Patrick Makau and Francis Kibiwott, and Deriba Merga of Ethiopia. Cheruyiot, Joseph and John Yuda were 20 seconds back, and the pack another 20 seconds behind them. Wanjiru was briefly headed at several stages, but surged back into the lead. The third and fourth 5km sections were run in 13:42 and 14:21. Kibiwott had dropped away by then, and the most serious threat to Wanjiru came when Merga took the lead with just 2km to run. But it was an attempt to slow the pace, which brought a rapid response from Makau and Wanjiru, who stretched away by himself to run the last 1097.5m in just over three minutes. Makau's second place in 59.13 gave him the third fastest time ever. The women's race was a more sedate affair, with a group of a dozen running together until around 16km and six still together with a kilometre to run. Pre-race favourite Berhane Adere sprinted away to win in the last 600m. February kicked off with three races on Sunday 4 February in Japan, the Kagawa Marugame Half Marathon (more), the Ohme-Hochi 30km race (more) and the Beppu-Oita Mainichi Marathon (more). The Beppu-Oita Mainichi Marathon (more) also took place on the west coast of the USA. The prestigious Osaka International Ladies' Marathon (more) was held on the last Sunday in January. On the same day the Khon Kaen International Marathon (more) took place in northern Thailand and, 12 hours later on the other side of the world, the re-scheduled Costa Rica Marathon (originally planned for 8 December 2006) was run in the capital, San Jose. The Medio Maraton Los Cabos took place in Mexico on 20 January, and was followed Sunday by the China Coast Marathon in Hong Kong and the Standard Chartered Mumbai Marathon (more). Two races took place this weekend: the Standard Chartered Dubai Marathon (more) (UAE) on Friday 12 January and the 3rd International Lahore Marathon (more) took place in Pakistan on 14 January. Two days after winning the Tiberias Marathon, Kenyan-born runner Mushir Salem Jawher (aka Leonard Mucheru) was stripped of his Bahraini citizenship for competing in Israel. The first athlete from an Arab country to compete in an Israeli marathon, Jawher won the race in 2:13:13. Bahrain's Athletic Union said in a statement on 6 January that it had received the news that a Bahraini national had competed in Israel with "shock and regret." "The union deeply regrets what the athlete has done," the statement said. A committee of sport and government authorities decided to strike Jawher's name off the sport union records and strip him of his Bahraini nationality. The statement explained that Jawher had entered Israel with his Kenyan passport and added that the runner's Bahraini citizenship was revoked because he had "violated the laws of Bahrain." Jawher was born in Kenya in 1978 and moved to Bahrain in 2003, according to the International Association of Athletics Federation. The first AIMS race of 2007, the St Croix International Marathon (more), took place New Years Day on the Virgin Islands in the Caribbean. It was followed on 4 January by the Tiberias Marathon (more); in Israel and the Mizuno Hong Kong Half Marathon Championships (more) on 7 January. The Antarctic Ice Marathon (more)ING Taipei Marathon (more) in Taiwan and the Angkor-Wat Half Marathon (more); in Cambodia. The final AIMS event of the year took place on 31 December when the St Catherine's Marathon and Half was staged around the foot of Mount Sinai in Egypt.